A graphing calculator isn’t a necessity for everyone’s mathematical needs. For many students, they just want the best scientific calculator they can get. But buyer beware; even though the most popular scientific calculators can usually be purchased for under $20, there’s a huge difference in the usability and capability of these calculators. You don’t have to be an advanced math student to tell the difference. The differences in the inputting methods would be obvious to any 5th grader since they reach to topics as fundamental as fractions. A wide variety of entry level scientific calculators will greet you at any electronics store. 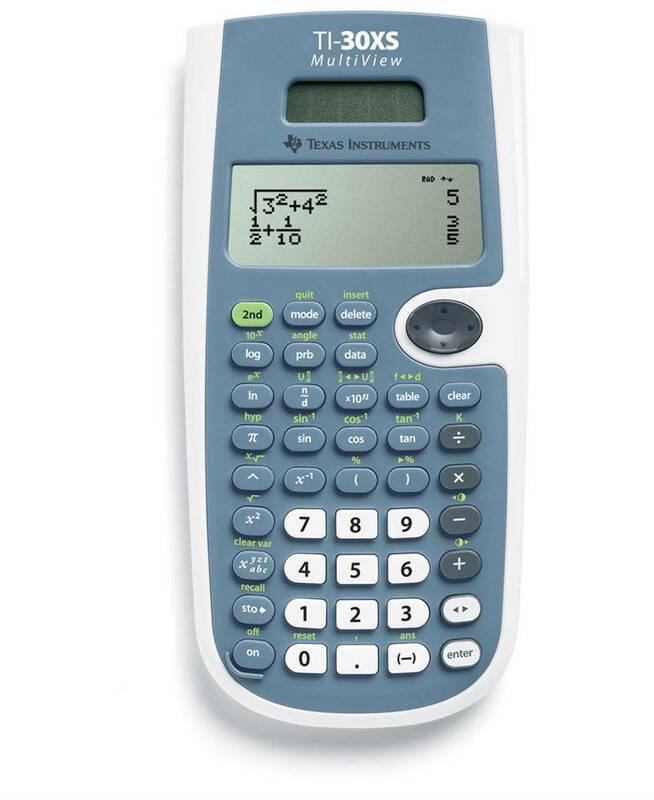 In the end, most students still select a Texas Instruments model, usually from the popular TI-30 series that has been around for decades. The TI-30XS Multiview is my pick for the best scientific calculator for school. In this post, I’m going to explain why the TI-30XS Multiview is the best scientific calculator for students. In short, it’s ability to use a fraction bar, to simplify square roots, and to return exact trig values make is a much better choice than the similarly prices TI-30X IIS. The TI-30X IIS and its partner, the TI-30X IIB (S for solar powered and B for battery powered), have been around since the late 90’s. The most important part of the TI-30X II’s name is the “II,” which tells you that this is a two line calculator. This means that a student can enter his (or her) work on one line, press enter, and see his answer on a different line, with his work still displayed. If a mistake was made, just pressing up will go back to that work to allow editing. The TI-30X II was a big advance from previous one-line versions of the calculator, but it’s not the nicest calculator in this series anymore. Our biggest complaints deal with the inputting of fractions, roots, and exponents. None of those can be inputted the same way on the screen as they will appear in a textbook. Additionally, special trig values are returned as approximate decimals instead of exact radicals. Admittedly, this is still the standard on almost all calculators, but for about the same price, the TI-30XS Multiview will give exact answers. To demonstrate the differences, I’ll work a few simple problems on the TI-30X IIS. Here, we get the right answer, but our question looks very different from what we had to type to get it. As you’ll see further down, that’s not the case with the Multiview. Well, it does equal .577 (approximately). But, as we’ll see below, there’s also an answer to this question involving square roots, and that is what’s usually more important in a trigonometry or calculus situation. Pros: Been around for along time and widely accepted by teachers, two-line display. 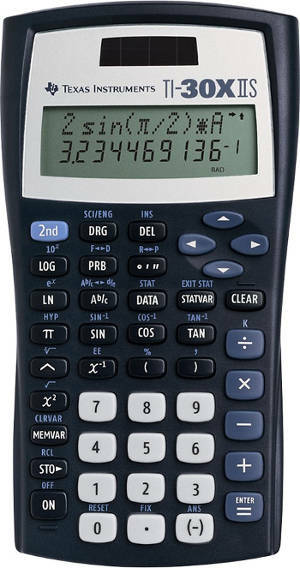 Cons: Requires students to learn new calculator syntax at the same time they are learning mathematics and its cost is very similar to the TI-30X Multiview. The areas where the older TI-30X II stumbles are exactly where the newer TI-30XS Multiview excels. Instead of a two line display, there are up to four lines, each capable of displaying a problem and an answer. It’s greatest strength is that everything can be inputted almost exactly the way it looks in a textbook. It also has the distinct advantage of returning exact results for trig functions. This makes it one of the only ACT legal calculator manufactured by Texas Instruments with this capability, including their line of graphing calculators. You can see that the Multiview allows students the ability to input with a fraction bar, far more intuitive than the TI-30X IIS interface. Again, the formatting for exponents and square roots is much simpler and appears just as it would in a textbook. It doesn’t require a ton of parenthesis like the TI-30X IIS. Now, we can see that radical answer. In fact, not only can the Multiview find exact values for special trig values involving radicals, but it can simply radicals, including rationalizing denominators. Pros: Just about everything. It’s great for students to be able to enter what they see in their textbook into their calculator since it allows more time learning math and less time learning calculator syntax. Cons: I don’t have any cons against the calculator itself, but you may occasionally run into a teacher that doesn’t allow it because they don’t like some of these features that Texas Instruments has made available. Here are even more about the differences on these two devices in a video I put together. There’s a hands down winner in this competition, and it’s the TI-30X Multiview. Some teachers may require the old school TI-30X II because they don’t want students to have a calculator that makes certain aspects of fractions, radicals, or trigonometry so easy. However, if you’re given the choice, it’s hard to understand why anyone would take a pass on the Multiview. Every year, millions of students head off to middle school or high school with the TI-30X II, despite the fact that for little to no additional cost, they could have had a big additional advantage in math and science classes. I always am left assuming that their parents didn’t have any way to know the massive difference between the two calculators. Of course, if you’re reading this, you know how to buy the best calculator for this school year without spending an arm and a leg. Click here to see the TI-30X Multiview price on Amazon.